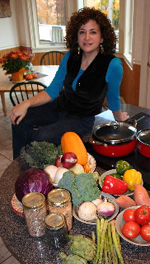 RHINEBECK FARMERS MARKET: Nava Atlas: "Wild About Greens"
Please join Oblong at the Rhinebeck Farmer's Market for a demo and book signing with renowned chef and cookbook author Nava Atlas. Celebrated vegan and vegetarian cookbook author Nava Atlas serves up a comprehensive collection of scrumptious recipes, all featuring ultra-healthy, super-nutritious leafy greens. Kale, collards, spinach, Asian greens, and many more leafy greens are a breeze to grow and prepare--and these 125 recipes showcase the most commonly used varieties in a wide selection of flavorful dishes. Nava's up-to-the-minute ideas range from using sturdy collard greens as wrappers for savory fillings to making luscious dips from arugula and watercress. There's even a section on green juices and smoothies that make it easier than ever to incorporate the most nutritious foods on earth into delicious everyday fare that everyone can enjoy. Nava Atlas is currently considered a "single author." If one or more works are by a distinct, homonymous authors, go ahead and split the author. Nava Atlas is composed of 2 names. You can examine and separate out names.